Aerona Beauty is a manufacturing & export company, selling professional barber and beauty tools to the customers all over the globe. Our company ensures that each and every Instrument being produced here is crafted to its perfection. Based in Sialkot - Pakistan and founded in 2001, Aerona Beauty is providing quality manicure implements and the best value prices. We design and manufacture high quality stainless steel instruments to the requirements of our customers for the use in diverse industries. All our products undergo stringent quality tests at every stage of the production to assure their flawlessness. We serve Professionals who demand exceptional quality Implements. 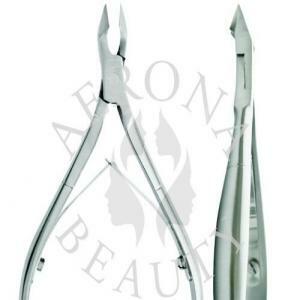 Aerona Beauty manufactures quality Professional Cuticle Nippers. All our Cuticle Nippers are especially made from the finest Surgical grade steel and Japanese J2-420 & 410 Stainless Steel to perform beyond limits. We are OEM Manufacturers,Suppliers & Wholesalers in Pakistan.Our range includes Cuticle Nippers with Back Lock,Double & Single Springs, Nail Cuticle Nippers having Lap & Box Joint with Wire Spring and more.Features sharp,long-lasting snipping tips for smooth cutting.Not for use on Acrylic nails.